In the South Korean movie The Host, the American military pours formaldehyde into the Han River and inadvertently creates a monster. This freak of nature not only goes on a murderous rampage but also is the host of a deadly virus. The movie, inspired by a real-life incident of contamination, is a cautionary tale of the consequences of tampering with the environment. At first glance, the current Ebola outbreak in West Africa would seem to have nothing to do with such ecological issues. The plague, which has claimed the lives of more than 1,400 people in the countries of Liberia, Sierra Leone, and Guinea, most likely came from an infected fruit bat that bit a toddler in a remote area of eastern Guinea in December 2013. The disease spread quickly from there to urban locations and then across borders. Beginning this summer, it has dominated the headlines. In August, it very nearly overshadowed the summit of African leaders that took place in Washington, DC. Ebola is a form of hemorrhagic fever. It has a very high mortality rate. There are no known vaccines, though several experimental drugs are currently being tested. Several outbreaks of Ebola have taken place in the past, but mostly in remote areas. Since it first appeared in the Congo region in 1976, Ebola has claimed around 3,000 lives. For all the media attention surrounding the current outbreak, Ebola is not the most pressing medical issue facing Africa today. Every day, 2,000 African children die from diarrhea. 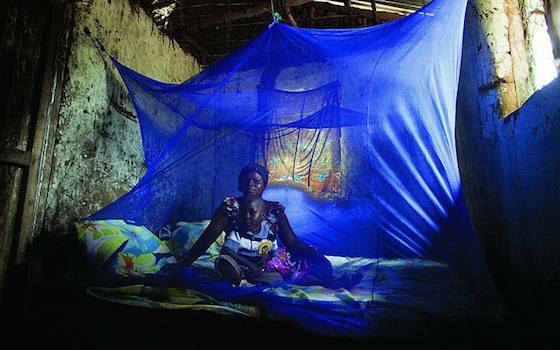 Every minute, an African child dies of malaria. In 2011 alone, 1.2 million Africans died of HIV/AIDS. The Ebola epidemic would have to increase several hundred-fold to match these numbers. What makes these diseases so tragic in their effects is that effective treatments exist that could bring the mortality rate down to near zero. In the case of diarrhea, that means clean water and sanitation; for malaria, that means mosquito nets and prescription drugs; for HIV/AIDS that means antiretroviral treatments. So far, the money has not been available in sufficient quantities to address these problems. Diarrhea, malaria, and HIV/AIDS no longer threaten lives at an epidemic level in industrialized countries. Ebola threatens to be something quite different, since it has resisted treatment. The media has covered the Ebola outbreak so extensively in part because of fears that the disease could spread beyond Africa. Books like The Hot Zone and movies like Contagion have primed people to expect the next major pandemic to emerge any day. But because of the way it spreads -- through direct contact with infected bodily fluids -- Ebola is not likely to become the next pandemic. Another reason the media loves to write about Ebola is because it fits comfortably into a neo-colonial view of Africa as a place of barbaric customs such as eating "bush meat." The consumption of infected chimpanzee or bat meat has been linked in the past to Ebola outbreaks. In this case, however, the outbreak had nothing to do with eating anything. And plenty of people in America eat "bush meat," which we simply call "game" — venison, boar, and squirrels -- and few people consider that to be barbaric. Of course, Ebola is worrisome because of the speed with which it has spread. One of the reasons that Ebola has spread so quickly is that medical personnel in Africa are already stretched thin dealing with these other diseases. But the other reason for Ebola's spread is environmental. The current outbreak of Ebola differs from all previous ones because it spread from a remote area to urban centers. And that happened in part because of deforestation. The area where this strain of Ebola first appeared -- the Western Guinean Lowland Forests -- have been cut down by loggers or to make way for farmers. West Africa as a whole has been losing more forests annually -- nearly a million hectares -- than any other place in the world. Humans are venturing into places that were hitherto largely untouched. In other words, residents in the region are now more likely than ever to have contact with carriers of Ebola. And they will also have more contact with one another, creating more opportunities for the spread of the disease. The environmental destruction of Africa's forests may well produce more outbreaks of the disease. And it might spread to areas with inadequate medical infrastructure. But if we're going to worry about the next global epidemic, it will more likely come from the flu or SARS, not Ebola. Still, we should be concerned about how our changing environment affects the spread of disease. Rising temperatures connected to human activity -- global warming -- has been linked to the spread of malaria and the greater incidence of flu epidemics. We simply don't know what alteration of the environment will trigger a calamitous pandemic. At the end of The Host, the monster dies. And eventually the current Ebola outbreak will burn out. But if we continue to treat our environment as a place to dump our garbage, the garbage will eventually come back and haunt us. It won't take the form of a science fiction monster. But Ebola, malaria, and SARS can be just as lethal as anything the movies have dreamed up for us.